2K Sports started an arms race with itself three years ago when it landed Kobe Bryant, the greatest player of his era, for the cover of NBA 2K10. Then it reached into the record books to trump him with Michael Jordan in NBA 2K11—and then grabbed Larry, Magic, and Michael for NBA 2K12. So when basketball fans wondered how NBA 2K13 was going to top last year, their eyes naturally turned to the cover subject. The real escalation all along was in three all-new modes of play developer Visual Concepts crafted for each of those releases. First My Player, the game's role-playing superstar fantasy, debuted, then came the Jordan Challenge, and then NBA's Greatest, a mode that connected me not only to the game of basketball, but also to the game that past generations loved. In comes NBA 2K13, with another three stars on the cover, none of them yet hall of famers. This is a game that has considerately backed away from trying to outbid itself, offering a broader-based pitch that includes a much needed control refinement, and presentation that bespeaks the really big name on the box, Jay-Z, who came aboard to serve as the game's executive producer. That does not mean NBA 2K13 stopped trying. It is, however, maturing into a lifestyle product, which is especially visible in the way you are encouraged to develop yourself as an NBA superstar, and outfit yourself in luxury accessories and slick postgame threads. And in the way you will pay for it all. 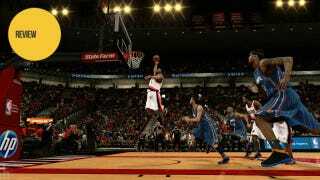 WHY: NBA 2K13 serves the flashiest sport and sports lifestyle in North America with rich gameplay and deep career modes. Platforms: PlayStation 3, Xbox 360, Wii, PSP. What I played: All modes of play on both Xbox 360 and PlayStation 3, spending the most time in MyTeam, MyPlayer and Association, in that order, with online play. Bends over backward, in gameplay, presentation and role-playing, to cater to your hoop dreams. MyPlayer is more approachable and fun than its previous two editions. Still intimidatingly deep, with a ton of specific moves that could stand to be made contextual for lower difficulty levels. The principal modes of NBA 2K13 are now united by "Virtual Currency," which is acquired after every career-mode game and can be spent freely no matter where you earned it. So if you're better at the team game, then winning in the old reliable Association mode can be used to fund your all-star's development so that your guy truly is a horse three weeks after his debut. Yes, you can rank him up the new-fangled way now—with cold-hard cash if you like. In MyTeam, the game's new fantasy-basketball mode. With enough people playing, matchmaking seems to keep you faced off against comparable squads—a very welcome sight in a game that also worked online on launch day much better than it ever has, some nagging, patch-addressable glitches notwithstanding. But the pay-to-win mechanic still is there; 10,000 in Virtual Currency is yours for $3, and it will buy a lot of talent for your fantasy team or your player. I used it, on a whim, to make a $500,000 contribution to Boston-area schools and boost my rookie's popularity. I know the amount because I heard the outstanding commentary team of Kevin Harlan, Clark Kellogg and Steve Kerr refer to it—at length—in my very next game. For as much as it is pressured to bring in a larger audience and sell them more things, NBA 2K13 does not compromise its well-seasoned, meat-on-bones simulation of a fabulously entertaining sport. At lower difficulty levels, the shooting may now be a lot easier to encourage newcomers. But it's also a lot easier to stop with well-chosen defensive schemes available on your controller's directional pad. Online, you'll typically see guys who try to run a lot of self-created isolation plays that are easy to clog up with a 2-3 zone defense. Of course, when they figure that out they usually start bombing three-pointers, requiring another adjustment, maybe to pressuring shooters. Active defense, particularly playing passing lanes, remains a difficult art for the novice because the game still leaves little room for subtle movements. There's still a lot of lurching and big-stepping when you're just trying to position a guy off his man's hip. Contextual defense—that is, getting the hands in a guy's face without being told, still requires proximity closer than I'd prefer, particularly if you're trying to play zone. Sometimes the best way to beat a defender one-on-one is to simply move around him, especially as many humans will overplay the ballhandler. Still, NBA 2K13 has taken the welcome step of splitting its player control between your two hands, which feels more natural. In last year's game, more complex dribbles, spins and crossovers were all on the left stick, using the left trigger as a modifier. Shooting was an unmodified gesture on the right thumbstick. NBA 2K13 sensibly mimics many basketball games before it—NBA Live is unironically referenced by some—by making the left stick your player's general direction of travel and the right his razzle dazzle moves. If you want to shoot with the right stick, you must now pull the left trigger. I usually just hit the square/X button because the timing is more familiar, but it's there. For basic functions and combinations, it's a more accessible control scheme but NBA 2K13 still does very little to teach it to you, which has historically been this series' biggest shortcoming. You can go through the game's training camp mode if you like, but my RAM fills up way too fast even to remember that a ripover jumpshot is basically the inverse of a stepback jumper. Seriously, go look at the instruction manual and tell me that's not still intimidating. You must learn how to do things in NBA 2K13 the same way you have in the past: By performing them live in competition and developing muscle memory for what worked. Where more casually knowledgeable basketball fans should spend most of their time is in MyPlayer, the superstar mode where you only have to worry about one guy. In the past this was a very demanding career mode that required some familiarity with spacing and duties in 5-on-5 basketball, and it handed down punishing appraisals of your performance. Now, with the buffed-up shooting and the easier ballhandling, lesser players can be a real demon even off the bench in their first season. If you're unsure how to get into this, just create a shooting guard and park on the wing or cut across the baseline. I did and gobbled up games like popcorn. MyPlayer is also the mode where 2K Sports really shines among all sports publishers. I wish something like MLB The Show or NCAA Football—the other two best singleplayer career games—did role-playing half as well as MyPlayer. All three have appropriate leveling systems and the means to improve specific skills, but that's just the starting point for NBA 2K13. Your pro has a robust off-the-court lifestyle, from postgame press conferences to shoe contracts and meetings with the team's general manager, and even to reading the chatter in a virtual Twitter-like feed—perhaps copied from Madden but still lively. I loved the between-quarter bumper ads hawking ticket packages that featured my player's face. Some of the conversations proceed haltingly but dammit, they're there, and NBA 2K13 takes every step to immerse you in your athletic fantasy where in other games, you must imagine a lot of it on your own. It's because the NBA, more than any other professional league in North America, has a recognizable lifestyle attached to it, getting back to the theme of NBA 2K13. And it's why Jay-Z was brought in. Games don't begin, they commence, with impressive opening highight montages that bear his creative thumbprint. 2K Sports always did its soundtracks well, but having one curated by this man is something altogether different, and the rest of the menu presentation serves it. I wasn't happy to see the press book disappear from the postgame menu—it's the package that gave you still shots and replay highlights of nearly everything significant in the game. It was probably cleared out for the Jay-Z presentation, but I can't deny that his influence makes this a true sports entertainment presentation throughout. If I have any regret about NBA 2K13 it's that it does not have a showcase like 2K11's "Jordan Challenge," or last year's "NBA's Greatest," or that neither even return, unchanged, to this series. Yes, MyTeam is a new mode unto itself, if copied from other Ultimate Team models, but it doesn't command attention the same way that Michael Jordan or the Knicks of Walt Frazier do. Those gentlemen still are in this game. All the historic teams from past NBA 2K editions are here, but having the Dream Team—the greatest assembly of athletic talent in any sport in the world—available only in a play-now mode is kind of like serving filet mignon at a buffet. The reason we don't have the Jordan Challenge or NBA's Greatest, even as premium DLC, is obvious: 2K Sports is protecting what was thought to be a dead concept in sports video gaming: back catalogue sales. And you should still hang on to those outstanding games if you have them. But the Dream Team deserved better than it got here, especially for all the trouble 2K went to get the bunch back together. NBA 2K13, as ever, shows an intellectual approach to its subject, a nearly unparalleled virtue in sports video gaming. EA Sports threw in the towel last week, but it bears mentioning that this game would obliterate even my most optimistic appraisal of what NBA Live 13 looked like back in May. Visual Concepts and 2K Sports may have eased the throttle back on what they can promise, but they stand on the gas when it's time to deliver. This still is a game made by people in an arms race against themselves. And we're the winners.